I've gone back and forth on the prospects for Amazon's smartphone, and yesterday's launch of the Fire Phone hasn't really helped me make up my mind. Apart from the heavily rumored 3D interface, most of what Amazon announced was a surprise to me. It's difficult to ignore the fact that Amazon holds some distinct advantages, but there are also certain areas where they seem to be fighting an uphill battle. Let's begin with the obvious, the pricing. Amazon's pricing strategy for the Fire Phone is very similar to those of other premium smartphones -- $650 unsubsidized and $199 on contract. This is especially curious given that the device is exclusive to AT&T, a carrier that has made it a priority to shift to unsubsidized, financing plans. Of course, it's entirely possible that Amazon has given AT&T a subsidy waiver. In this case, the potential of Prime users on heavy data plans could be considerably attractive to AT&T. But this is just speculation on my part. Another challenge is that the Fire Phone's heavily emphasized differentiator (the 3D interface or Dynamic Perspective as Amazon calls it) may not be much of a differentiator at all. The Fire Phone's market penetration is unlikely to be high enough to spur a large number of developers to leverage it in a meaningful way. This would limit the value of Dynamic Perpective to the device's UI. For the sake of argument, let's assume that consumers find it valuable. This is by no means a given, but if it does happen, what stops other premium OEMs like Apple and especially Samsung from using this feature? 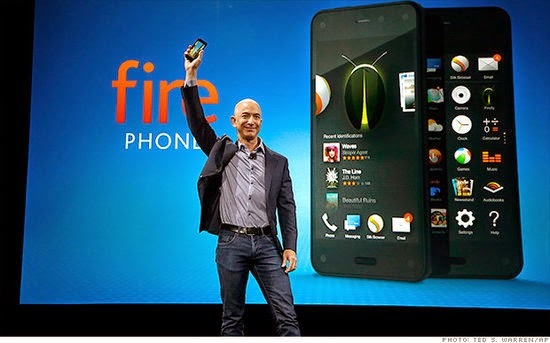 The Fire Phone certainly faces a host of challenges, but it holds some distinct advantages as well. The first is Mayday, Amazon's one-tap access to customer service (via video chat). Amazon's customer service is really unparalleled and there are few companies (if any) that could attempt to offer a 24-hour video chat service with a 15 second response time. This could be very useful for technology laggards and first time smartphone buyers. However, this proposition would have been far more valuable if the pricing strategy catered to that segment. Firefly is another interesting feature that will be difficult for other firms to replicate. It is effectively a camera-driven, real-world search engine which hooks into Amazon. In other words, a customer could look at a product in a physical store and buy it on Amazon within a few seconds. In a way, it attempts to use Amazon's product range and credit card database to make mobile payments unnecessary. The primary goal of the Fire Phone is to support Amazon's e-commerce business model and this partly explains why Amazon went the premium route -- Premium smartphone buyers are likely to make more online/offline purchases. However, high-income customers can only use Firefly if they end up buying the phone.